Hello, I'm back with photos of the little jeans and denim jacket I've made. I'm having a blast sewing all these miniature clothes :) The Aus Girls are great to sew for....the clothes aren't small and fiddly, so I can make replica people fashions without too much trouble! I used the Liberty Jane Bootleg Jeans pattern for these and adjusted it to fit. I'm not keen on the waistband so with the next pair, I made a different waistband and made the fly open instead of just being for show. It's such a cute pattern :) It has proper pockets and all the stitching you see on regular people jeans....cute! 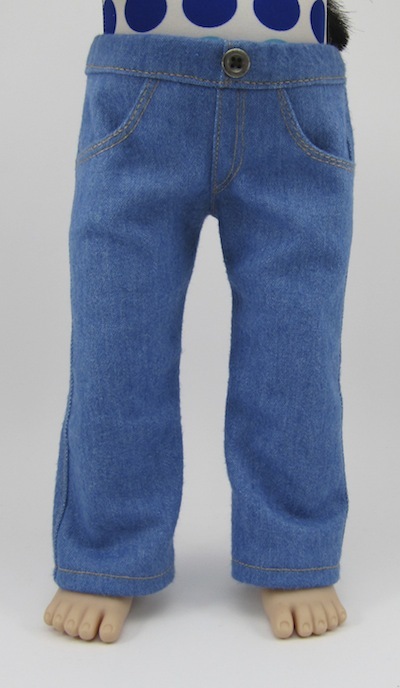 This is the revised version, with opening fly and shaped waistband....made in a lighter weight denim. The jacket is from a pattern that comes with the book called Complete Wardrobe for 18" Dolls. It's going to need a lot of adjusting before I make the next one! As you'll see in the next photo, I had to 'tuck' the back to bring it in quite a lot. The pocket flaps need to be smaller also....and the sleeve head is a little too big for the armhole opening. So....when I make the next one, I'll correct all these issues! The front has been closed with large press-studs, then buttons sewn on for show. That is a LOT of detailed stitching! It just amazes me when you talk about adjusting this and that. You're awesome! Hugs! You've done a great job with this cute little outfit. 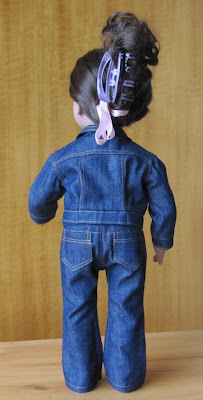 I too have used the Liberty Jane Jeans pattern. I made the skinny leg jeans for Belle. I wasn't keen on the waist band either. 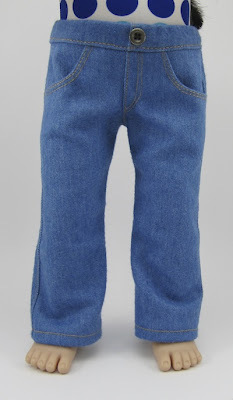 I used a pair of my old jeans and the denim was a little too heavy so next time I'll use a lighter weight denim.